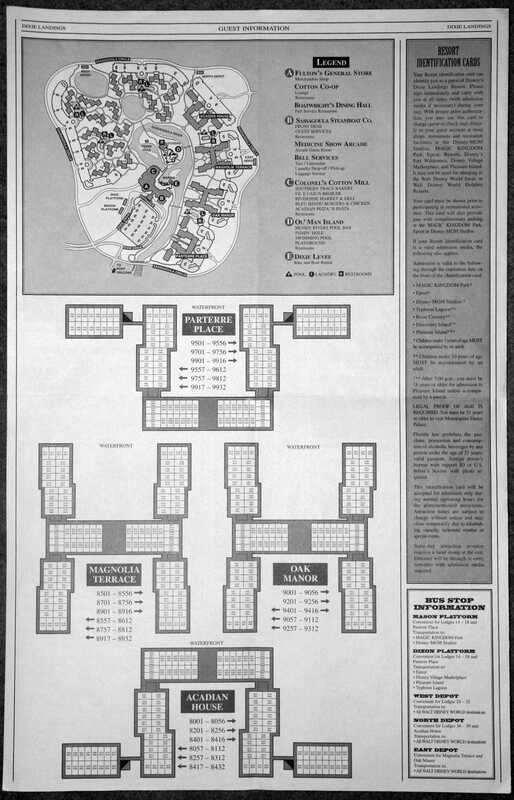 The Sassagoula Times was the free information sheet issued to guests staying at the Port Orleans / Dixie Landings Resorts from the resorts’ initial opening in 1992 until the middle of 2009. 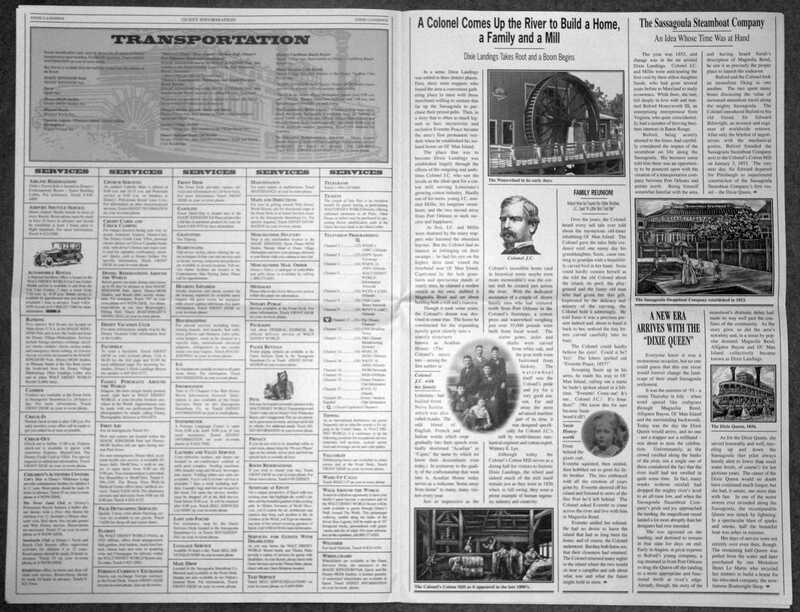 The publication started as two extremely elaborate eight-page tabloid format (11"x17") newspapers — the Sassagoula Times for Dixie Landings and the Sassagoula Sentinel for Port Orleans — which documented in intricate detail the entire fictional backstory for the two resorts, while also providing guests with relevant information for their stay such as facility opening times and maps. 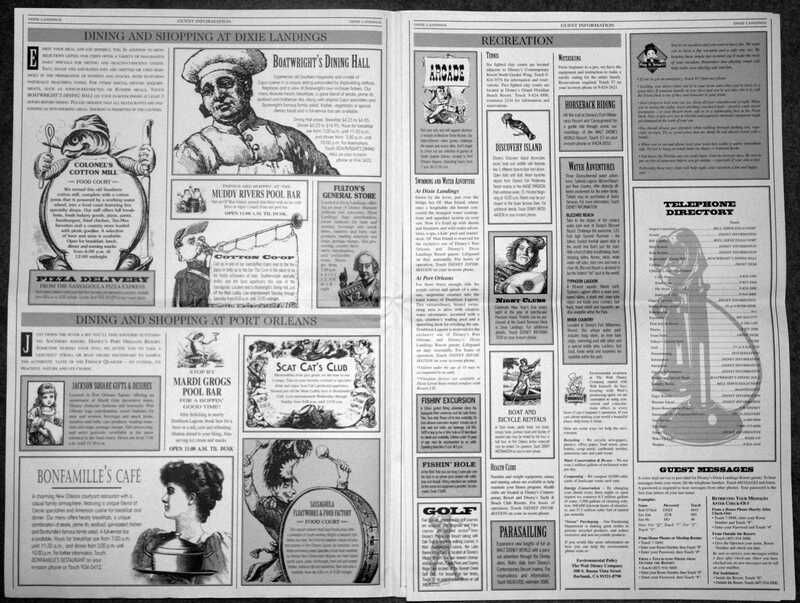 By 1999, the publications had been reduced to a single four-page tabloid format information sheet, dropping all of the backstory detail and concentrating solely on current guest-relevant information and resort maps. 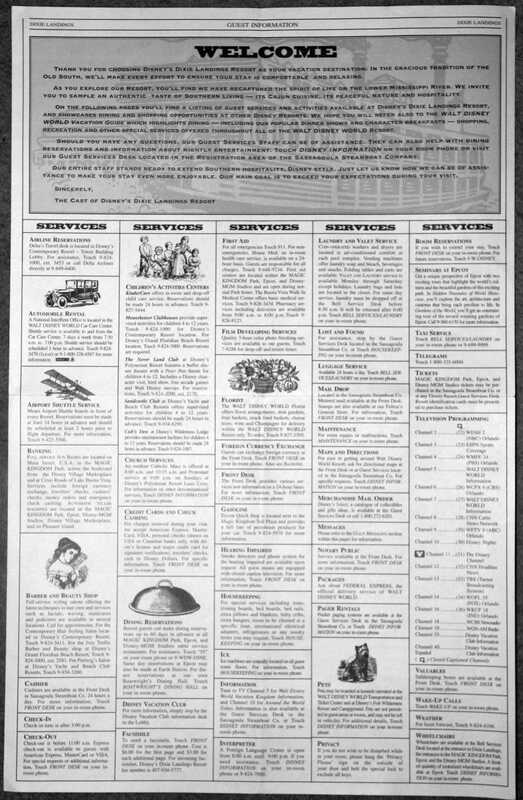 By 2002, The Sassagoula Times was being issued in a further reduced format, a four-page letter-sized (8.5"x11") handout containing Frequently Asked Questions and general resort operating information for guests. 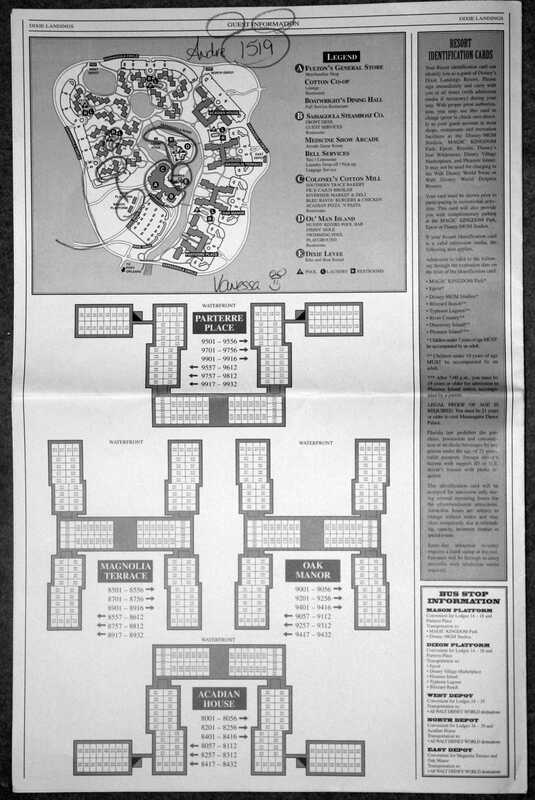 Resort maps were no longer included, instead being provided as a separate letter-sized sheet. 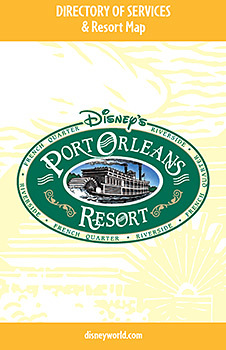 Finally, between May and August of 2009, the last vestiges of the resorts’ former glory were finally laid to rest with the introduction of the current generic “Port Orleans Directory of Services and Resort Map”, a small 3" x 4½" fold-up pamphlet containing the same basic information but in an easy pocket-sized format. Score another victory for the bean-counters over the original story-telling Imagineers. 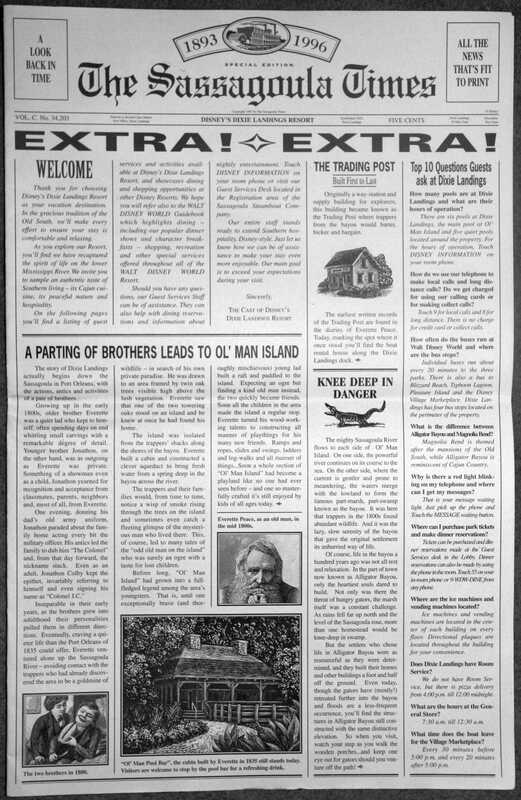 In 2013, a larger and more informative multi-page Welcome Pack was introduced, and although it is still entirely fact-oriented rather than providing any of the resort’s backstory, it is much easier to browse through. Instead of being given out during the check-in process, this is now provided in each guest room in a blue folder, which is more useful if you are using the new direct-to-room checkin facility. 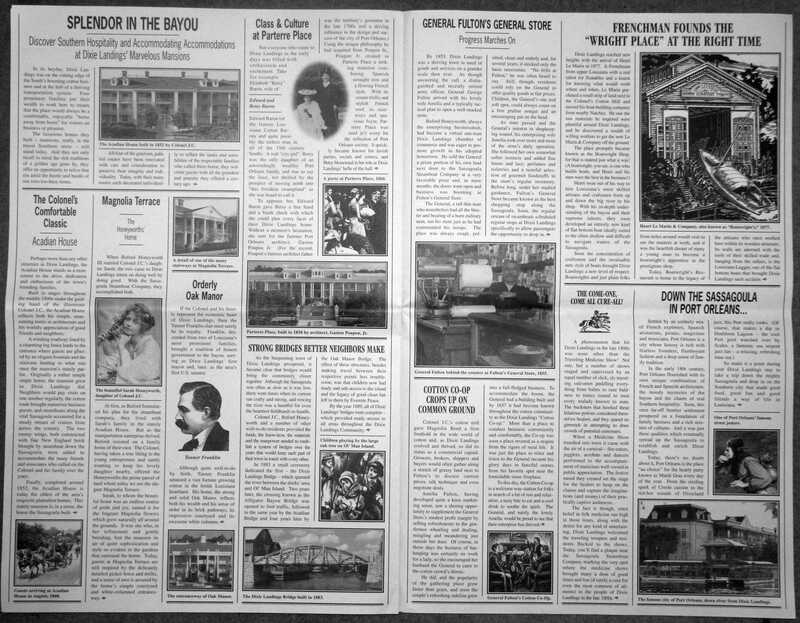 Here are some samples from recent years to whet your appetite for what’s to come when you arrive at Port Orleans. Please remember that all the information contained within these documents (even in the latest edition here) should be considered ‘historical’ and thus subject to change. Please see the Recreation Activities Page. 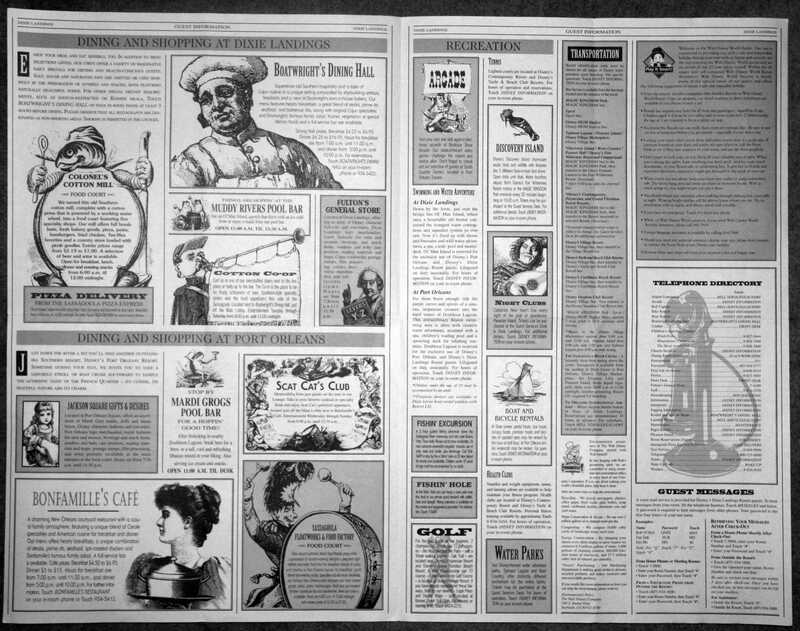 The following items are still to be scanned, but here are some quick digital snaps of the old larger format Sassagoula Times newspapers from bygone Dixie Landings days.